Seriously stylish, the 18k925 collection is a modern take on iconic glamour. The name refers to the 18K gold and .925 silver combination that makes these pieces bold, sophisticated and unique. Diamonds, colorful gemstones, exquisite quartz, and creative doublets set this collection apart. Each 18k925 design incorporates Tacori's signature Crescent motif of interlocking half-moon arcs, and an elegant "Tacori Gem Seal" adorns virtually every piece! 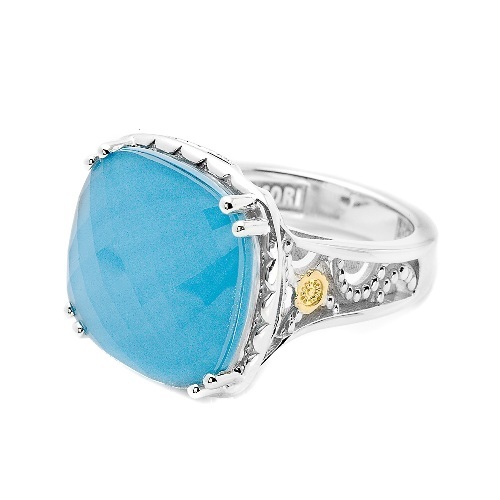 The refreshing combination of Clear Quartz layered over Neolite Turquoise makes this cocktail ring eye-catching and dreamy. Available in Sterling Silver with 18K Yellow Gold Accents. Color / metal choice may be available to select in the "drop down" box in the "add to cart" area. Other variations may be available. Please call or chat with us! Spanning four decades, Tacori designs have fused classic elegance with modern inspiration, creating some of the world's most highly regarded and exquisite jewelry. TQ Diamonds has exclusive rights to represent and sell their jewelry. Tacori has personally chosen TQ Diamonds because we have the experience and expertise to properly represent Tacori and provide you with the best service available. Tacori does not sell directly to the public. Tacori is a designer and manufacturer of rings, fine jewelry and accessories. All of their jewelry is distributed to the public exclusively through fine quality, authorized jewelers like TQ Diamonds. At TQ Diamonds an authorized Tacori retailer, we are happy to assist you with sales, pricing and service. International and Express shipping available at checkout. Custom orders - Please allow 7-10 working days for delivery. Other Financing options at 9.9% APR or less!